Now available in Santa Barbara! 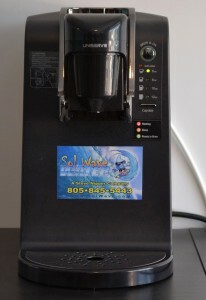 The Sol Wave Coffee Maker. 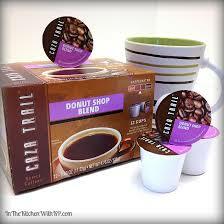 This individual cup brewer will use any brand K cup and also comes with a complete delicious line of coffee and tea. Our system can be directly plumbed into your reverse osmosis system so you never have to worry about running out of water. Come by our Santa Barbara location and try a cup for yourself! While you are visiting you can taste our reverse osmosis water (also available every Saturday during Santa Barbara’s Farmer’s Market) along with our “water from air”. Our showroom includes water softeners, whole home systems, carbon backwashing, alkaline drinking water systems. Don’t forget to check out our water vending locations for the cleanest, tastiest water in the West!!!! Please call or email for samples today! Why order coffee from OfficeMax or Staples at $.75/ cup when we can deliver it for only $.55/ cup, Serving Santa Barbara, Montecito, and the Santa Ynez Valley and beyond.